As promised, today we pleased to announce the opening the Cloudeight Booster’s Store. Our Booster’s store features special prices on our most popular products and services. And from now until April 27, 2016, we’re celebrating the opening of the Boosters’ Store with special intro prices – Boosters can save up to $60 right now… If you’re not a Cloudeight Booster you can join us by gifting $10 or more. Please visit this page to join the Cloudeight Boosters. Our Cloudeight Boosters’ Store is now OPEN! If you’re a Cloudeight Booster, login to your Cloudeight Booster’s account right now and you’ll see the store information with links to the new Boosters’ store after you sign in with your Booster’s username and password. Our Cloudeight Boosters Store is our way of thanking your loyalty and support. We’ll be adding new products, freebies, and fun contests soon too. If you need help or have a question, let us know. If you’re not a Cloudeight Booster, you can join us for as little as $10. You’ll save much more than that on your first purchase. Right now, we really need your support. We hope you’ll take a few minutes today and help us with a small donation. After you donate, you will receive info on how you can become a Cloudeight Booster. Help us continue to help you with a donation. Visit this page to make a donation – and you’ll be able to take advantage of big discounts from our Cloudeight Boosters’ Store. For a limited time we’re offering our Windows 10 pre check and post check up service PLUS our Windows 10 customization service, all for one great price. 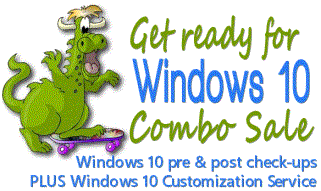 Get all the details about our Windows 10 Combo Service here. Thanks so much to all of you who subscribe to our newsletters and support our websites. We both appreciate it very much.